PARADIS PLAGE "SURF YOGA & SPA RESORT"
Welcome to PARADIS PLAGE "SURF YOGA & SPA RESORT"
Paradis Plage is the unique Surf Yoga and Spa Resort in Morocco, located in the region of Agadir, near to the surfer's village of Taghazout, in the middle of the most famous blips of surfing in Morocco. 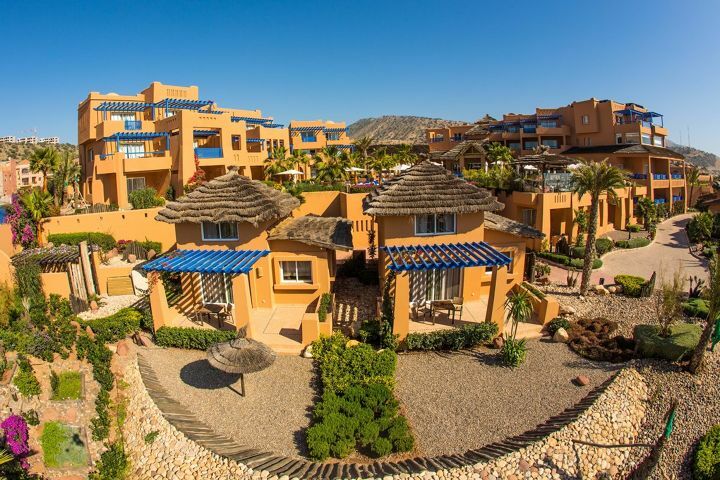 The Paradis Plage is positioned on a 5km stunning white sand beach between the Atlantic Ocean at the front and a backdrop of the Atlas Mountains. 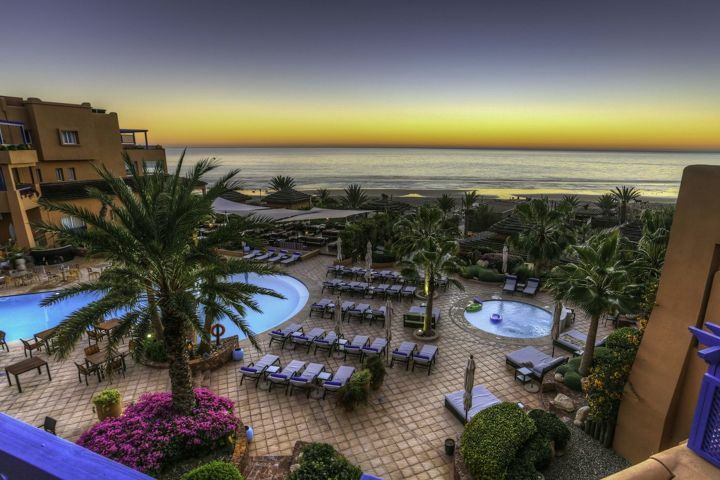 It is one of the worldwide leading Surf, Yoga and Spa Resort in Morocco and with only a 45 minute transfer from Agadir this is the perfect place to catch a wave or just to relax and unwind. The Paradis Plage has a reputation for being a true surfer’s paradise and offers instruction at all levels. Close to the surfer's village of Taghazout, one of the most famous surfing area in Africa this hotel has access to some of the best waves for surfing. Set in 3 hectares of well designed tropical gardens, the resort offers a little piece of paradise for all those seeking relaxation and rejuvenation. The Paradis Spa has an extensive menu of treatments for those wanting some pampering. 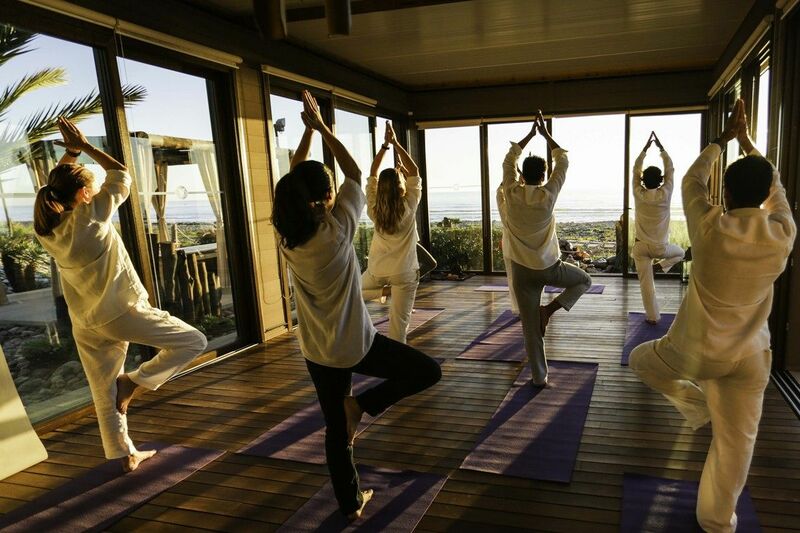 Yoga pavilions overlook the beach and with the crashing waves and sea grasses blowing in the wind, this yoga experience is truly sensational. If you feel like some cardio try working out in our well equipped fitness centre, also overlooking the beach. A range of fitness and cross fit classes are also available to guests every day. We believe we have something for everyone. 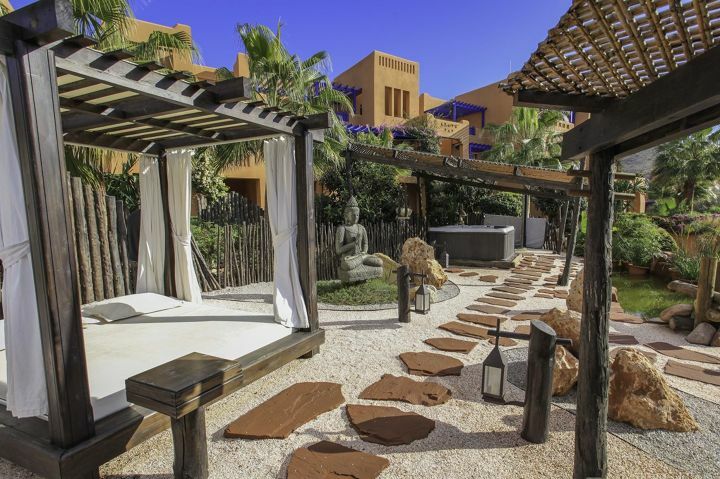 Somewhere to relax, de - stress and be pampered, practise or learn to surf or somewhere to simply enjoy a Moroccan beach holiday. Suitable for families, couples, groups of friends and solo travellers - there is really something here for everyone. At Paradis Plage Surf, Yoga & Spa Resort, we believe we have created an environment that will enable you to relax and allow you to 'Liberate Your Senses'. Fitness room, beach volleyball, beach soccer, canoe. For a fee: Yoga Shala with 2 pavilions and 4 daily classes, Surf House (surfguiding, private lessons and group lessons), stand-up paddle, horse riding, Golf (about 5 km, local provider). ‘Zen garden’ with hamacs and hot tub. Extra charge: Traditional Eco Spa with outdoor massage area ,Hammam and rituals, Applications in the spa area. Children's club from 4 to 11 years, Children's pool, playground. Against Fee: Babysitter. • MASSAGE SENSORY, Orange Blossom, Verbena, the Candle, Chocolate, open Air. Every day, from sunrise to sunset, the team of teachers Yoga Paradise Beach offers a delightful setting for dynamic and relaxing sessions. Practice your posture to the soothing sound of the waves, in our bright, open space of the ocean and share with Nico Shanti traditional and joyful education, where the awareness of posture binds breathing for a trip to the well-being and peace. With stunning views of the ocean and the pool of the hotel, the rooms are very spacious and have a large furnished terrace that offer all the comfort you need to feel comfortable. Sophisticated and welcoming rooms come with a double bed and a bathroom. These rooms are decorated in soft and slightly bluish tones, while handicrafts and paintings bring a real touch of color. Possibility of access for people with reduced mobility. Inspired by world famous names mythical spots: Uluwatu , Bells Beach, the tip anchors, Hossegor, the beach bungalows , with an area of about 70 m2, are real " small houses " duplex with furnished terraces (20 m2) and private gardens . The thatched roof , wood beams apparent, the oak staircase and the floor of the bedroom has a special charm to these bungalows waterfront. The living room opens onto a terrace of 20 m2 with a spectacular view over the gardens and the ocean for relaxation in a most quiet. They also have all the full equipments. The rich flavors of the Moroccan soil is in the service of healthy food, fresh and fragrant, with a majority of products from organic agriculture from a local farm, a pioneer in this field in Morocco. Thanks to the nearby village of terraced fishermen, priority is also given to fresh fish, brought every morning by artisanal fishing boats. For breakfast, get all vitamins, muesli, freshly squeezed juice, pomegranates, prickly pears and other fruits of the region depending on the season, or Moroccan pancakes accompanied by honey produced from hives around. The Surf House of Paradis Plage Resort has been designed to become the true meeting point for lovers of skiing. Covering an area of 100 m², the surf house includes a bar area, lounge area and a large terrace facing the sea, to meet for a drink after surf sessions. To meet all your gliding, learning to search for the perfect spot, the team of the Resort is available to assist you in this activity and make progress in the best possible conditions. All surfing equipment are signed Rip Curl. We provide you with the best equipment available: boards, wetsuits and accessories. More experienced surfers will be able to see the waves of the region, on spots accessible by boat. You can also treat yourself to new sensations by trying to learn stand-up paddle, or simply strolling on the ocean with our boat from the Resort. You have at your disposal a qualified surf instructor , who will take you on the spot best suited to your level. You can then "drag " benefiting from personalized advice, with a professional and secure framework.
" Stand- Up Paddle : discover new thrills and chills"
Waves of Morocco offer a wide range of spots with different conditions of waves. Indulge yourself with new thrills and chills ! Try stand- up paddle with our team of instructors and discover a new vision of surfing. - Possibility of hiking Stand -up paddle. "Explore the surf at your own pace : Independent Living"
You already know about Morocco, but the waves of the Agadir region still kept their secrets : Team Paradise Beach is here to help you explore the surf at your own pace and according to your desires. - Possibility of rental cars.
" Rental of material : enjoy our Surftech boards and wetsuits Rip Curl"
Surftech Test Center with our range of Surftech boards , try new shapes and draw new curves ! - Surfboards : quatro , fish , egg , bow thruster , longboard, etc. .
" Surf Club surf all year"
The Surf Club Paradise Beach is open year round for surfers of all levels, from discovery to development , with appropriate supervision, professional and secure. Many courses with surfers or professional coaches are available. More secure storage of boards and wetsuits racks are available to customers surfers Paradise Beach Resort . In winter, the moderate offshore winds blow N/E giving amazing conditions from October to April. From May to September, the “Chergui”, a warm N/W wind blows and can spoil the quality of the sessions. Tides vary between 0.6 to 2 meters and may affect the non-profound water spots. Many sea-urchins and rocks – bring boots. You need a 3/2mm wetsuit from November to April with a water temperature between 16°C and 19°C. From May to October, a swimsuit, a top or a springsuit is sufficient. The 11 and the 12 : very nice lefts, tubular during the first section on a rocky flat stone, reef wave feeling when take-off – to surf especially in low, rising tide. Banana : Long right coming from a cliff and ending up on a pebble or sand beach. This low tide wave can be extraordinary, turning into a nice right left peak and sheltered from the Northern wind in the rising tide. - the inside, long and hollow, is smaller and steadier. When the swell is quite heavy (1.50m), those sections can be connected and the wave allows a 300m surfing. From this size, the wave current and power become dangerous and require a very technical surfing. Bouilloire : also known for its sea-urchins, this is a spot that well-receive the swell. Offshore wind, sideshore by a Northern wind, a very good right on the flat stone of the rock. Not many waves, very quickly crowded and can be surfed from low to half-tide. Not easy launching and coming out of the water for those who are not used to rocks, boots are recommended. Reachable for regular level surfing. Around Mirleft, typical fishermen village, there are many rocky or sandy peaks, working in terms of tides and winds. Most of the peaks are in the wild bays or at the cliffs’ feet, in the deserted atmosphere of the Moroccan’s Great South. surfeur débutant - Cours 1H30 par jour. Beginner surfer - a surf course of 1H30 per day. Surfboard and wetsuit RipCurl included Surfeurs confirmés. 2 sessions de surf par 1/2 journée guidées par nos moniteurs. de surf. Confirmed surfers - 2 sessions of surf per 1/2 day guided by our instructors. *depending on conditions, an additional of 100Dhs may be asked to cover the cost of transfer to another spot. Reviews on "PARADIS PLAGE "SURF YOGA & SPA RESORT""